Another two shows of the upcoming Nitzer Ebb Industrial Complex Tour 2010 just got confirmed! 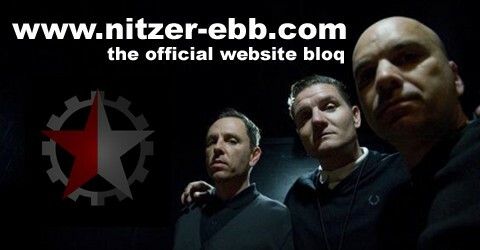 On January 27th, 2010 the band will be on stage in Gothenburg and the last german date on this tour will be at the backstage in munich on March 3rd, 2010.
nitzer-ebb.com (the ebb’s official euro website) wishes all fans, friends and supporters a merry christmas and a happy new year! Some more live dates are added to industrial complex tour schedule 2010. The band will play in budapest and warsaw, as well as barcelona and madrid in march. You have now the opportunity to pre-order the new Nitzer Ebb Album Industrial Complex at the Major Records online shop or per mail to the special reduced price of 12,90 € (plus postage). The Album contains all new tracks plus various exclusive remixes. Every pre-order for new the album takes part in a draw for two concert tickets. Furthermore the first 100 purchaser will get a Label Compilation CD for free. After 20 years nitzer ebb will be play a show in Nottingham again. The date is confirmed for february 19th, 2010 at the Rock City. You must return your defective CD to Control Industry. Be sure to include your return address, email address and phone number so Control knows where to send your replacement CD and how to contact you if they have any questions. The convention of the universe fanmeeting will be take place at the berlin postbahnhof on january 8th, the night before the first Depeche Mode concert with support by Nitzer Ebb!